This river feature immediately downstream of the R/H bank willow tree, marked the start of the heavily impacted river section 250m upstream of the double weir installation. 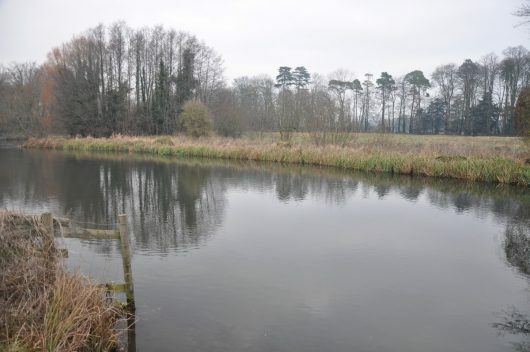 The water depth was 1.5 metres over-lying 500mm deep sediment deposits. 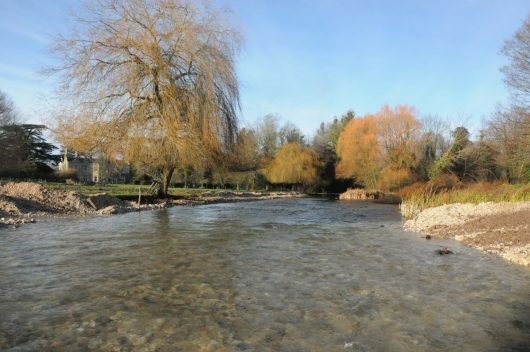 Determining the precise location for the construction of a pipe bridge to safely transport 5,000+ tonnes of extracted gravel across the main river Test at this juncture was a tricky but project-critical exercise. Photo 35 The deep, canal-like flows encountered during the survey and design phase, made the Pipe Bridge location choice much more challenging. One of the considerations we faced at this location (and indeed throughout the entire reach upstream of the weir impoundment) was how to determine the new geomorphologic riffle, pool, glide sequence in a free and fast-flowing, ‘letter-box’ shaped channel profile, whilst confronted with a 1.5m deep, slow-flowing and featureless canal. An option would have been to temporarily remove the weir boards, but this would still only have produced a partial drop in level, so we opted for total reliance on survey data. Photo 36 The pipe bridge crossing location. The only credible way of designing free-flowing pool/riffle/glide features in an impounded channel is to use detailed topographic data. 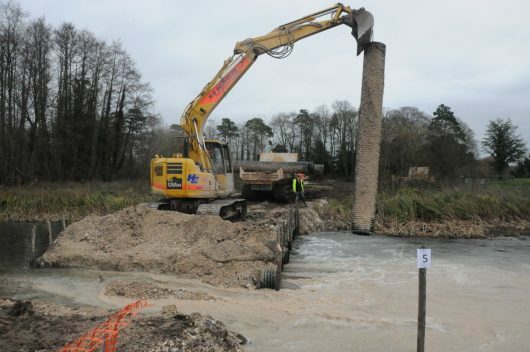 The known overall gradient top to bottom of site was 1:450 and our plan was to re-use gravel from the pipe bridge construction to create a substantial ‘riffle’ and flow attenuator directly over the bridge footprint during decommissioning of the bridge. 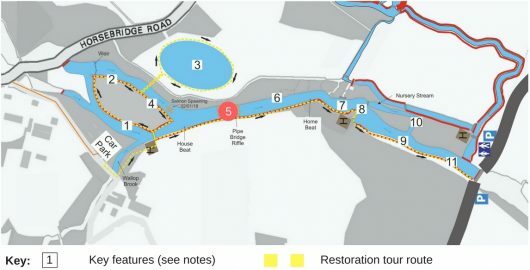 The pipe bridge location therefore, needed to be reasonably precise to correspond with the overall pool/riffle/glide sequence plan. Trying to determine channel geomorphology and optimal flow-rate discharge by sight, in a heavily impounded channel, is akin to night-flying without instruments. Short of chancing it by guesswork, the only credible way of achieving certainty was to plot the outcome using ‘instrumentation’. A Leica TS12P Robotic Total Station was used to gather the long section and cross-sectional data at key points down the channel. 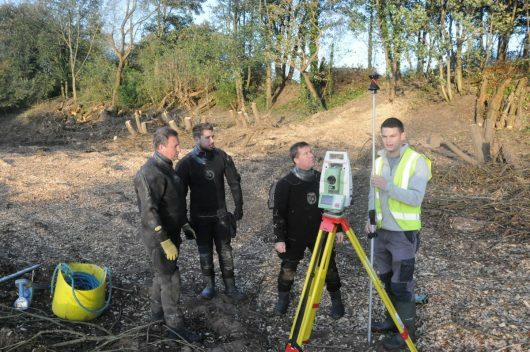 Photo 37 James Sowden, Cain Bio’s in-house surveyor, briefing the operations team during a detailed ‘topo’ survey in preparation for an up-coming re-alignment of the river Mersey. Detailed ‘topo’ survey data is critical in understanding how to manage river flows down any given gradient. 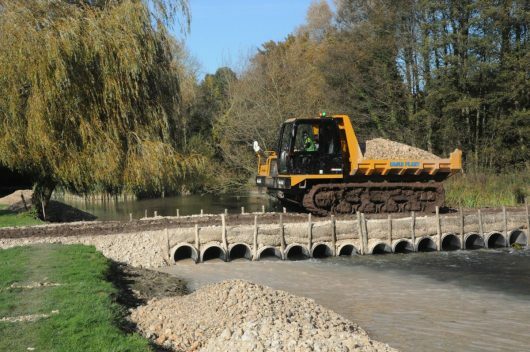 Approximately 500 x 10 tonne loads of site-won gravel were transported in tracked dumpers across the temporary bridge to the rest of the project site. Two pipe bridges were constructed to service the delivery needs of this project. The second bridge was constructed across a carrier to deliver gravel to the upper House beat and salmon-spawning sites seen in features 2 & 4. Photo 39 Deconstruction of ‘Pipe Bridge’ crossing on project completion. Wherever possible and in the interests of cost savings, time and environmental gain, all retrievable materials used in temporary structures such as this (i.e. chestnut posts, industrial-grade plastic pipes and gravel) are re-cycled for immediate or future use. Photo 40 Site-won gravel used in the pipe bridge construction was re-cycled to create ‘Pipe Bridge Riffle’ as seen in the foreground. 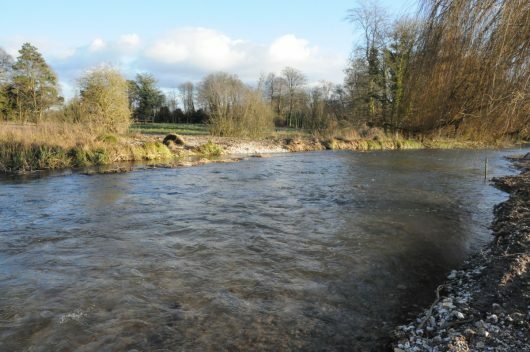 Photo 41 Upstream view to Bossington House over the newly-installed ‘Pipe Bridge Riffle’. 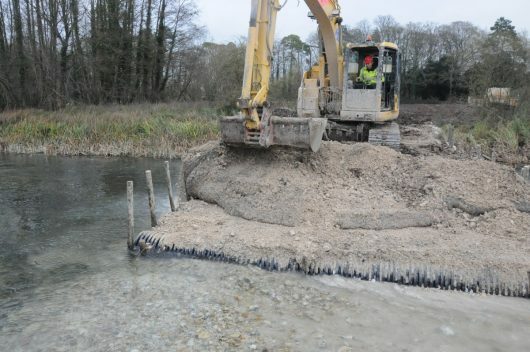 Following removal of the ‘Pipe Bridge’ a substantial and fast-flowing gravel riffle was left in its place. 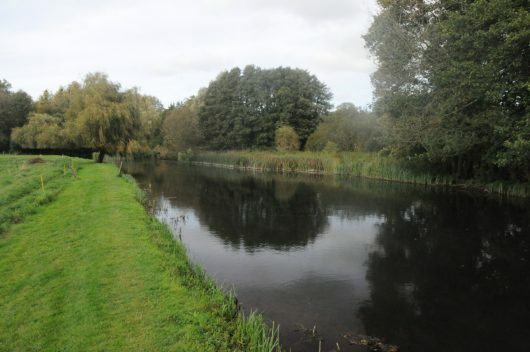 The height or ‘crest’ of the riffle was carefully calibrated, as was the overall width of the riffle, such that flow velocities were optimised to deliver high-quality chalk stream habitat. 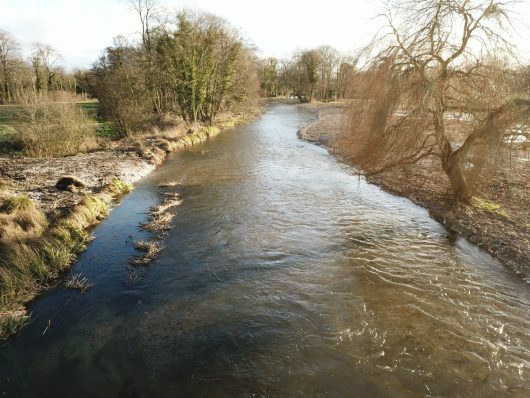 A key objective of these engineering works was to deliver a diverse range of flow types and river bed topography to optimise conditions favourable to a healthy rheophilic fish, plant and invertebrate community including Watercrowfoot (Ranuculus). Re-introduction of meanders is also a key component in achieving flow diversity and this is covered in feature 6. Photo 43 Downstream view over pipe bridge riffle. The finished height (crest) of the riffle was used to optimise flow velocity and water depth in the immediate upstream reach.